The Illinois PGA Section announced today that Steve Orrick, Head PGA Professional at Country Club of Decatur, has won the 2018 Central Illinois PGA Chapter (CIPGA) Player of the Year title. It is the 10th time he has captured the title, having also won nine years in a row from 2007 to 2015. Orrick collected 392.5 points playing in six events and never finished out of the Top 5 during the 2018 CIPGA tournament season. He won Stroke Play #3 at Stone Creek Golf Course and finished in second place in two other events – Stroke Play #1 at Weaver Ridge Golf Club and Match Play Championship at Ironhorse Golf Club. He finished T-3, 4th and T-4 in the three other events in which he played. Kurt Rogers (Red Tail Run GC) finished second and David Lundy (Mt. Hawley CC) finished third in the CIPGA Player of the Year standings. 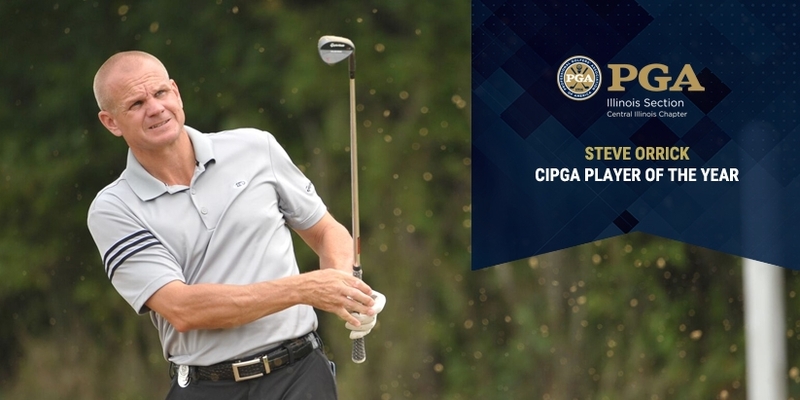 “Steve has long been one of the top players in both our Chapter and Section tournament events and it’s wonderful to see his efforts rewarded with the CIPGA Chapter Player of the Year honor this season,” said Carrie Williams, Executive Director of the Illinois PGA Section. In addition to his Player of the Year honors, Orrick qualified to compete in the 2019 PGA Professional Championship which will be contested April 28-May 1, 2019 at Belfair Golf Club in Bluffton, S.C. Orrick finished in 8th place at the Illinois PGA Championship at Stonewall Orchard Golf Club in Grayslake, Ill. in late August to qualify for the National PGA Professional Championship. It is the 9th time he has qualified for the national tournament. The Central Illinois PGA Chapter is part of the Illinois PGA Section and includes approximately 100 PGA Professionals who work at golf facilities located in cities south of I-80 to the Effingham area. The Chapter includes major Central Illinois markets such as Decatur, Peoria, Bloomington, Champaign and Urbana.